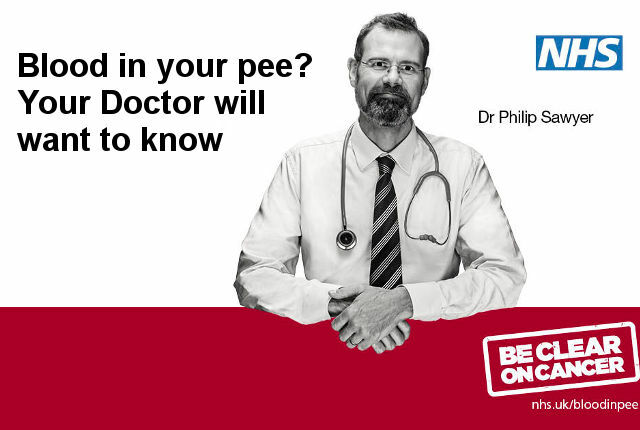 A national campaign was launched this week to encourage everyone to look before they flush and visit their GP, without delay, if they notice blood in their pee, even if it’s just the once. Even the tiniest amount of blood in your pee can be an early indication that something is wrong. The national ‘Blood in Pee’ campaign which runs from 19th July to 23rd September encourages everyone to look before they flush and visit their GP, without delay, if they notice blood in their pee, even if it’s just the once. The ‘Blood in Pee’ campaign is part of the wider ‘Be Clear on Cancer’ campaign to raise awareness that this can be an early symptom not only of bladder and kidney cancer but other cancers and conditions too. The campaign is aimed at men and women over the age of 50. On the Island around 250 urological cancers are diagnosed every year. A new short film featuring TV doctor, Dr Dawn Harper, is being released as part of the campaign. The film shows what to look out for as the colour of blood in your pee can vary – from very diluted, to bright red or even dark brown, like the colour of weak black tea. If you have any of the above symptoms, go and see your doctor. 1 Comment on "If you notice blood in your pee – even just the once – get it checked"
“See your doctor without delay”. Ho, ho. Fat chance in Cowes.